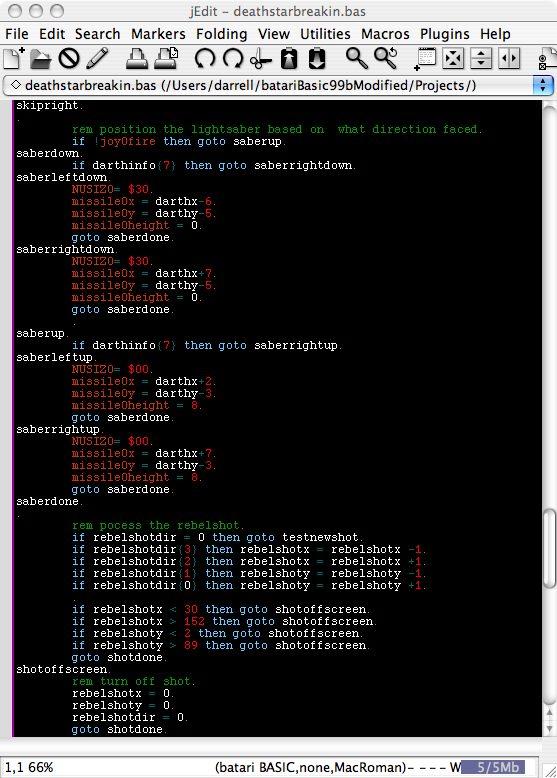 To use the syntax highlighting, put the batari BASIC.xml file in the MODES directory of jEdit. Then edit the catalog file in the same directory and add the following. <MODE NAME="batari BASIC"		FILE="batari BASIC.xml"
I ve installed JEdit with the batari syntax and I really love the clarity of reading the program. I would like to know how you compile your file to a .bin from it? I was using VisualBb on XP but I got trouble with my bootcamp and rather continue on mac if possible. Guess its not as easy as visualBb to compile and send to stella as it must require more typing steps.